As the Georgian capital Tbilisi struggles to recover from a calamitous flash flood, a political storm is brewing – one in which incumbent authorities are trying to blame their predecessors for shortcomings exposed by the tragedy. 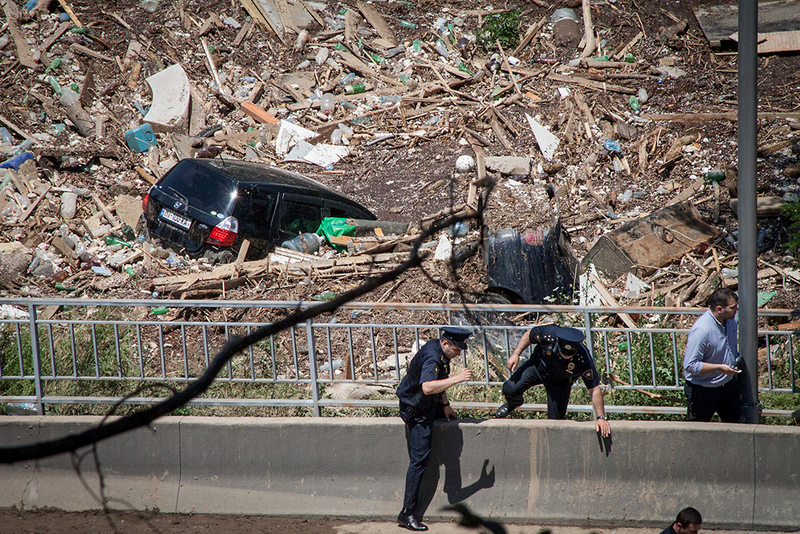 The June 13-14 flash flood killed 19 people and caused an estimated $45 million in damage. Roughly a day and a half after the tragedy, prosecutors opened an investigation into the construction of a 4.5-kilometer-long expressway that passes through the Vere River valley, the site of the flood. Various observers – including Tbilisi Mayor Davit Narmania, a representative of the Georgian Dream coalition which has the upper hand in politics these days – have claimed that the drainage system for the highway, a high-profile project built during former President Mikheil Saakashvili’s administration, was not equipped to handle possible overflow from the river. Saakashvili now is the governor of the Ukrainian region of Odessa, but his political legacy still looms large over Georgian politics. Representatives of the opposition United National Movement, Saakashvili’s old power base, contend the investigation is a political witch-hunt aimed at former Tbilisi Mayor Givi Ugulava, who commissioned the project in 2009. A Saakashvili protégé, Ugulava currently is in jail pending trial on what supporters dismiss as politically motivated charges of misconduct. UNM lawmaker Giorgi Kandelaki argues the government is using the highway investigation as a smokescreen to cover up its own failure in crisis management. “They had no less than three hours from the moment of the landslide and the first (emergency) call to close the road and evacuate people. They did not do it,” Kandelaki stated. [Editor’s Note: Kandelaki formerly worked as an editorial associate for EurasiaNet.org]. Neither the Interior Ministry nor the Prime Minister’s Office responded to EurasiaNet.org’s requests for comment. Environmental and urban planning experts also believe it is far too early to place blame, or make accusations of negligence. At the same time, many endorse the notion of carrying out an inquiry into the government response. “Political parties will always blame each other, but the role of the government is to take [the] responsibility of [sic] managing emergency situations,” said Kakha Bakhtadze, a program manager at the Caucasus Environmental NGO Network. A commission of experts and officials, headed by Gharibashvili and Tbilisi Mayor Narmania, and also including the highway’s designer, Tamaz Shilakadze, has been created to assess how similar disasters could be avoided in the future. Up for consideration is whether or not to replace the highway completely. So far, the commission’s mandate does not appear to include an evaluation of the government’s crisis-management performance. Two non-governmental organizations, the Georgian Young Lawyers’ Association (GYLA) and the Institute for Development of Freedom of Information, are also probing the circumstances surrounding the flood. GYLA Chair Ana Natsvlishvili does not believe that questions about the highway necessarily mean that the response to the flood has been politicized. “The wider public … has the same questions,” Natsvlishvili noted. “What is important is that the investigation is done according to the law and that we ask ‘Could [the flood] have been prevented?’” she added. Many believe it could have been at least anticipated. Others have called attention to a chronic problem: a lack of impact assessments in public works. Only a partial environmental-impact study was completed since the highway was classified as a reconstruction of an existing road, noted Bakhtadze, the NGO program manager. EurasiaNet.org could not immediately locate any environmental impact study for the highway in the city’s online archives. Critics claim that the political need for fast action on the highway prompted the then-UNM-controlled city government to dispense with the eco-review. Bakhtadze and others, however, say the absence of a comprehensive environmental assessment for such a project is nothing unusual. No Georgian government has placed much value on natural resources management and risk assessments when development projects are pending, Bakhtadze claimed. If the road had not been built in the area where the flood hit, buildings would have been, with potentially far greater costs to human life and property, he said. “We are still in the Soviet Union in this regard,” he said, referring to the manner in which officials make decisions about infrastructure development. Tbilisi State University’s Soso Salukvadze, a professor of human geography, agreed. No long-term urban planning has ever been done for Tbilisi, a city of 1.2 million people, even though it is situated in an area with a long record of earthquakes and floods. In the case of the mid-June flood, animals appeared to suffer more than humans. Representatives of the Tbilisi zoo, which borders on the expressway and Vere River, estimate that the flood displaced or killed roughly half of its 600 mammals, reptiles and birds. Here, too, politics has surfaced. When prosecutors summoned Zoo Director Zurab Gurvielidze for questioning relating to the June 17 death of a Tbilisi man who was mauled by an escaped tiger, many Tbilisi residents believed the government was trying to shift blame, and took to the streets in protest. The prime minister, without producing any evidence, accused the UNM of organizing the event. A top UNM representative, attorney Zaza Bibilashvili, fired back, alleging that authorities failed to conduct a proper search for the escape tiger prior to the fatal attack at the site of a warehouse near the zoo – despite the fact that a credible sighting had been reported. The reason that police were reluctant to conduct a thorough search of the premises, Bibilashvili claimed, was because the warehouse reportedly belonged to billionaire ex-Prime Minister Bidzina Ivanishvili, who remains a force behind the scenes of the incumbent Georgian Dream government. Publicly available property records do not clearly establish who the owner of the warehouse is. Meanwhile, discussions are resuming about relocating the zoo, with Ivanishvili, a private zoo owner, offering to contribute funds, if need be.